Returning home in the light evening today I noticed Blackbirds 'chinking'. This is a very persistent call, often by several individuals, that I usually associate to summer evenings. 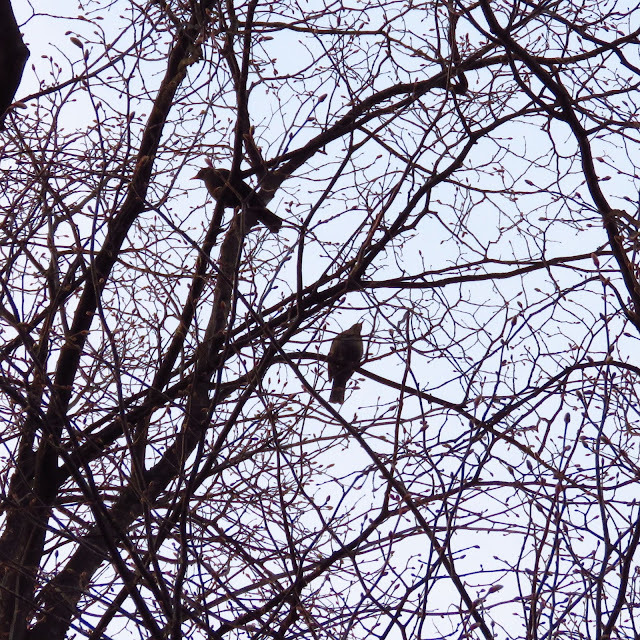 The blackbirds, up to four of them, were in the tree where the Tawny Owl nest box is. The owls are indeed in occupation, although they were nowhere to be seen from the ground. They have been calling at dusk, and every few days I have been able to watch one of them as it called, sat on the box for a few minutes and then left to go hunting. Often, later at night, one calls with a lovely gurgling sound from inside the nest. Two of the blackbirds got close to the entrance, calling non stop, if there was an owl in the nest, they might be able to see it. At some point they calmed and left, but then one returned, started calling and the others joined him in the tree. I wondered that the 'chinking' is not a roosting call, but a mobbing call to an owl, which is more likely to be encountered active as nights become lighter in the summertime. In a couple of weeks, the leaves would obscure the view and although a blackbird calling is evident, a quiet owl sitting inside a tree is not. This is a lovely clip of blackbirds mobbing a Tawny Owl demonstrating the call and also how fearless they are towards the owl. UPDATE 7 April 2017. From the living room at 20:05, I heard a Blackbird suddenly starting to 'chink' and I looked at the nest box. 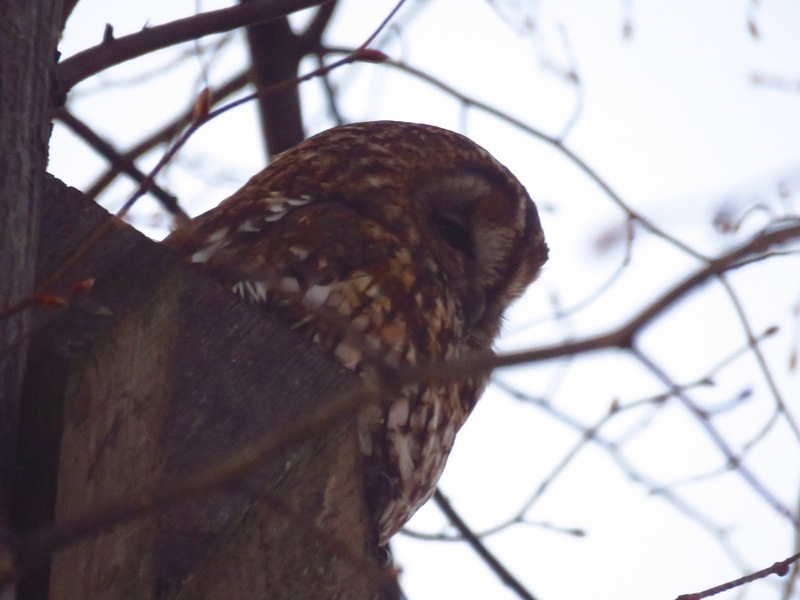 The round silhouette of a Tawny was sitting atop the nest. It was light enough to get a low resolution photo.